The most exciting place we visited during our crazy fortnight with my brother and sister was the Forbidden Corner in North Yorkshire. We had all been before but it hadn’t lost its charm. The Forbidden Corner is difficult to describe. It is part garden, part fairy tale, part quest, part maze, part adventure. 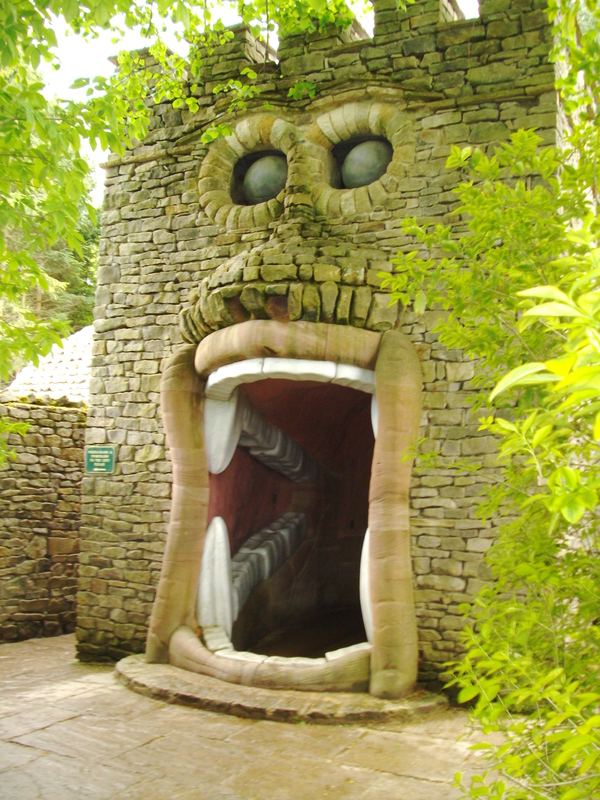 It is a wonderful place filled with gardens, woodland, tunnels, statues, gates, doors that only open from one side, rooms with multiple doors, some leading nowhere, and all sorts of whimsical things. Visitors explore the garden with a checklist showing some of the main things to see. If you manage to see everything on the list, you have probably explored everywhere, including repeating some sections several times to make sure you have covered every single path. There are signs dotted about welcoming you to your quest and pointing out that you have reached a dead end or that you have a long way to go. You meet a wide range of characters in the statues, including a bears’ poker game, the lord of the underworld and a talking horse. There are several statues that try their hardest to soak you with water as you pass them. Unless you’re very careful, they will probably succeed at least once while you’re there! We spent about two and half hours exploring the Forbidden Corner and I’m fairly certain that we saw everything, but the girls could easily have spent more time there going round their favourite parts again. You have to book your day in advance as it’s very popular, so you have to take your chance with the weather. Rain was forecast for the day we went, but we were lucky to avoid it. It stopped just as we arrived and started up again as soon as we drove away! It is difficult to show a lot of pictures of the place without spoiling the experience of visiting, the point is that it is mysterious and you go and explore to see what you can find. Don’t be put off by the lack of details about it, it is totally worth going. Visited their website but i am saddened by the fact that they are too secretive. It would be cool if they at least shown some pictures, sort of thriller. wow! it’s a pretty entrance out there! it’s interesting and looks fun. It surely looks forbidden 🙂 great choice there!